I enjoy them. They’re quirky, they bop around, yank live bait out of the ground, and they fly. I like almost everything that flies. Wasps, not so much, airplanes, yes! As Summer lingers, along with 90+ temperatures, we are looking forward to autumn. Even as I write, Judy is bringing up the seasonal decor. I just noticed a gourd filled cornucopia setting before me. To my right is a pumpkin shaped candle, and above a book shelf are an array of paper leaves in gold and russet. 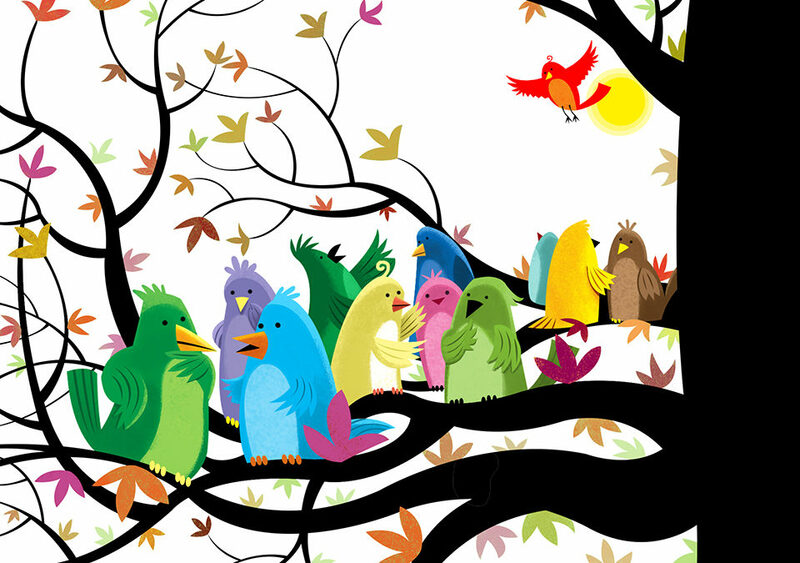 Sensing the mood, if not the cooler temps, I drew this gathering of birds piece. The most prominent birds in our area are the geese that sweep in formation over our house each morning. I haven’t seen them today, so maybe they are already en route to their winter homes. They are a dramatic site and every year I gawk at them in wonder. We had a canary for some time when I was a kid. Maybe that nurtured my love for birds. Judy doesn’t like bird feet. I like them, they are well designed and serve their purpose. When I first showed this illustration to Judy, she was bothered that I didn’t draw their feet. At her behest, I added them. This is ironic, because Judy doesn’t like bird feet. I suppose she finds them contrary to the soft elegance of the rest of the bird. I find them appropriately designed appendages well-suited for their purpose. And they’re fun to draw. Penguins are always fun. They are some of my earliest zoo memories. I once watched as two penguins pecked at each other, seemingly in the throes of a disagreement, when out of nowhere a third penguin walked between them, disrupting the fight. The two combatants turned to pursue this tuxed peacekeeper. It was rather fun. 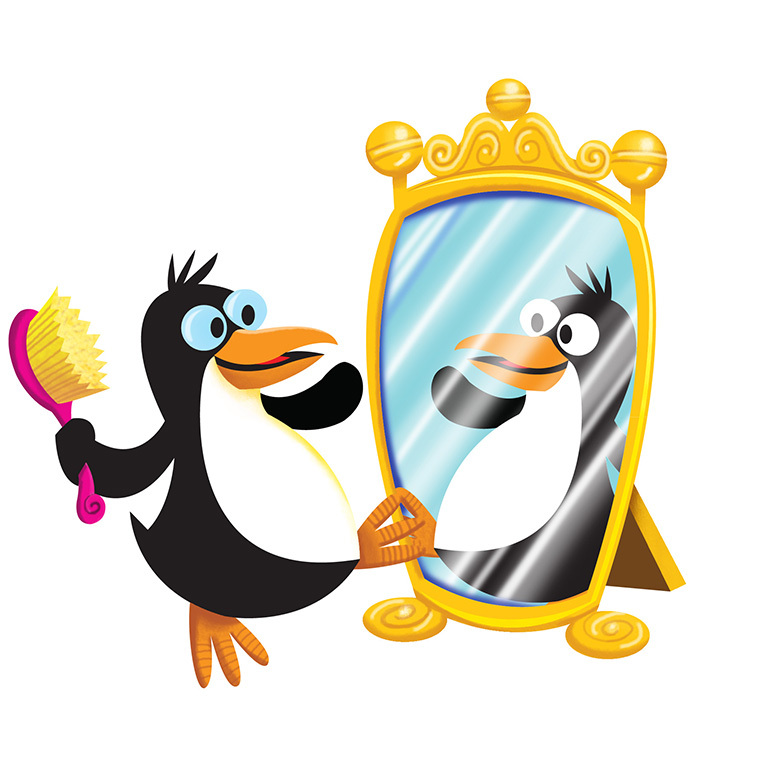 I drew this Primping Penguin for Joshua Barker’s delightful book, Say It Fast Five Times, a collection of witty tongue-twisters. Again, bird feet are fun to draw. Did you collect leaves to take to school so that you could place them beneath paper and rapidly color over their imprint. That was a highlight for me. I liked it more than going to the blackboard to solve math problems. I liked getting a tetanus shot more than solving math problems. Anyway, that little art and craft project brings back good memories. 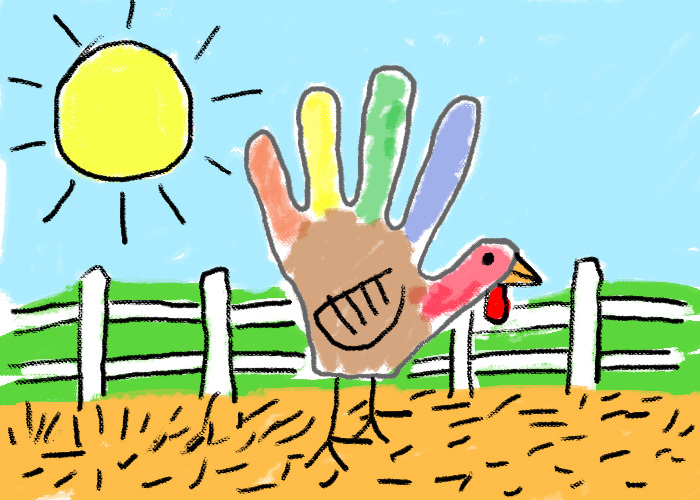 As does drawing a turkey around your hand, another autumnal ritual. This is a grown-up, faked example of the hand-rutkey. Always a crowd pleaser. Autumn is a favorite season, although I’m not as fond of the winter that follows. I like color and winter is soft on color. The muted grays are okay for a week or two, but the sooner the color, the better, for my tastes. I did the bird meeting at the top a few weeks ago in early anticipation of the the coming season. I call it Fall Meeting. You can imagine the purpose yourself. Maybe they are pondering their route southward, perhaps discussing menu and recreational options. Or it may be a bird congress, debating a bill, or amendment to the bird constitution. Who knows what birds are up to? Whatever the purpose of this gathering, they make a colorful site among the changing leaves, don’t you think? Eddie, I never know where your brain will fly or alight next, but I love the way you think and draw. I just love your flights of fancy, period. That is just the cutest convocation of fine-feathered friends I’ve seen in quite a while. I love to listen to birds, too, albeit sweet-singing canaries, and not so much raucous-honking geese. When I was in high school, my boyfriend’s bird always made a beeline (birdline?) for my head. Not fun! And Martin Luther said, “You cannot keep birds from flying over your head, but you can keep them from building a nest in your hair.” There is some bird-food for thought in that, Eddie. Knowing that birds of a feather flock together, I chirp a cheery good-bye, from one bird brain to another! PS You are such a truly gifted cartoonist and brilliant writer. I’m so glad you are doing both! I’m glad you enjoy my whimsical silliness. Regarding the diet: embrace the feet. Anything that can cling to a branch has to be good for you. The corrolary between branch clinging and good health is vague, but probably there somewhere. Thanks so much for reading and for your kind comment!